Happy October! Since the Canadian Thanksgiving is this weekend (how did that get here so fast? 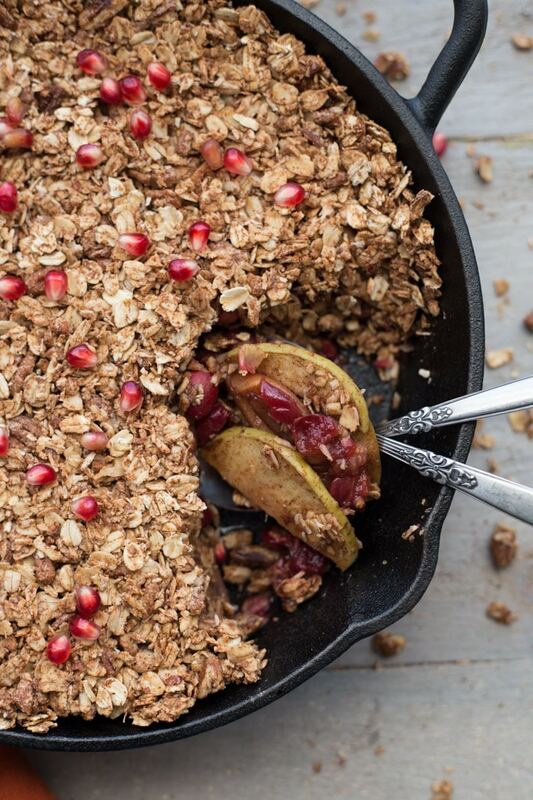 ), I thought I would take a break from pumpkin this week and go all in with some other fall inspired recipes, starting with this Apple, Cranberry and Pomegranate Oatmeal Crisp. It’s a little bit sweet and a little bit tart, and perfect to feed a crowd at your Thanksgiving gathering! I know I’m not alone when I say October is the best month of the year. I love the colors, the smells and the cooler temperatures. The leaves are changing color and slowly piling up in our background. The days are shorter and the air is a little crisper, making for cool mornings and brisk evening walks. It’s time for big sweaters, wool socks and cozy blankets. Have I convinced you yet that October is awesome 😉 ? While I love the weather and the beautiful fall foliage, I also enjoy cozy evenings by the fire with a hot cup of tea. 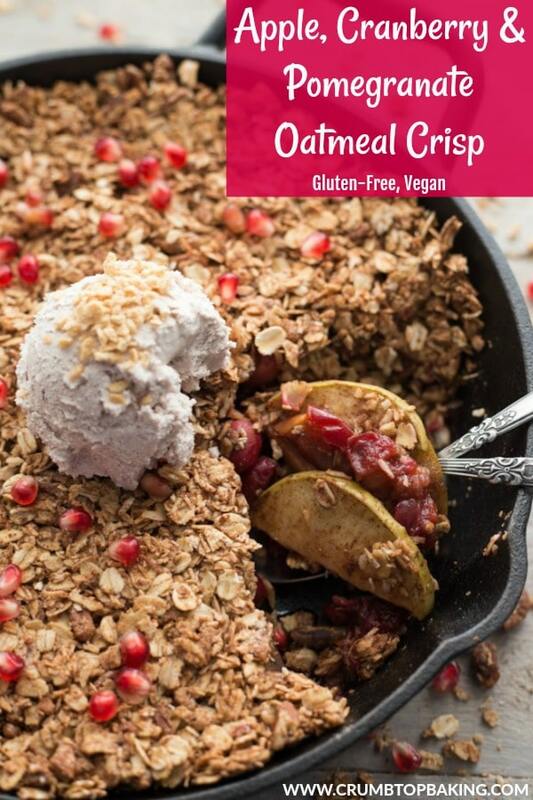 And lately, my hot cup of tea has been accompanied by this Apple, Cranberry and Pomegranate Oatmeal Crisp. Truth be told, my morning coffee has also been accompanied by this crisp. Believe it or not, it’s really that good (and good for you), and I’ve made multiple batches, so I really have that much to eat! 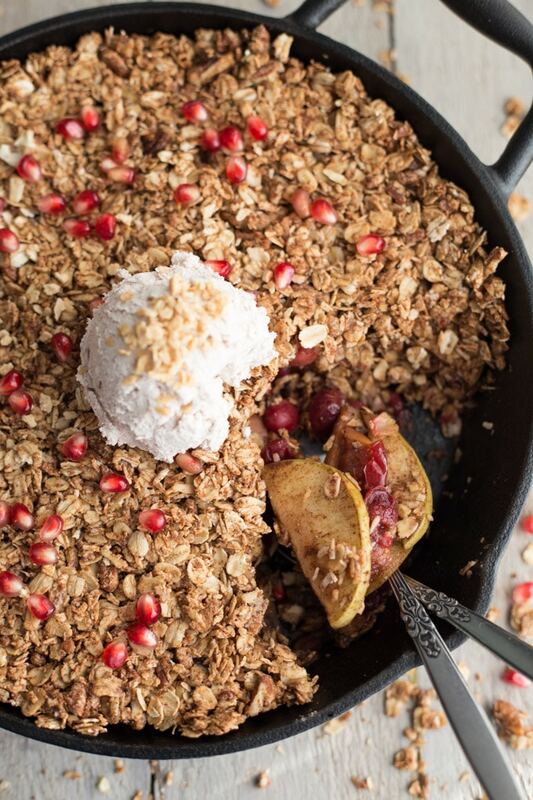 So before you judge me for eating dessert for breakfast, let me take a moment to convince you that this Apple, Cranberry and Pomegranate Oatmeal Crisp is just like an oatmeal bake and, therefore, totally appropriate for breakfast! The fruit base is a combination of apples, cranberries and pomegranates with some coconut sugar, maple syrup and cinnamon. It’s not overly sweet, and the tartness of the cranberries balances out the sweetness from the coconut sugar and maple syrup. The oatmeal crisp topping is just like a big pile of granola (for more on my granola obsession see here and here!). It’s made mostly with rolled oats, pecans and coconut, and packed together with some almond butter, maple syrup, coconut sugar, cinnamon and salt. The topping gets crispy without any butter or oil, which I totally love. And with all the oats, pecans, apples, cranberries and pomegranates, you definitely get your fibre fix! This crisp is super delicious on its own or with a dollop of coconut cream, a drizzle of maple syrup or even yogurt. I may have tried all of the above! I make this crisp in my cast iron pan, which I like because the crisp bakes evenly and doesn’t burn on the edges (I can’t always say this about my casserole dish). Best of all, this crisp takes just 30 minutes to bake. Add 15 minutes of prep work, and you have your Thanksgiving dessert (or maybe even breakfast) in just 45 minutes! If you decide to make this for Thanksgiving (which I highly suggest! ), let me know what you think in the comments below. 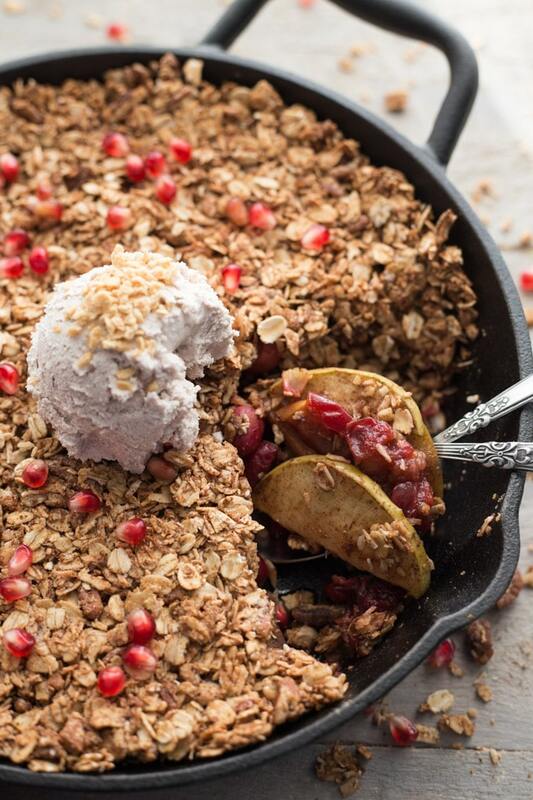 Apple, Cranberry and Pomegranate Oatmeal Crisp is sweet and tart, and the perfect clean eating dessert to feed your Thanksgiving crowd! With lots of fresh fruit, oats and pecans, this crisp is full of fibre, so you could even get away with eating it for breakfast! Pre-heat the oven to 350F and grease a cast iron pan with olive oil. (I used a 10″ round pan). 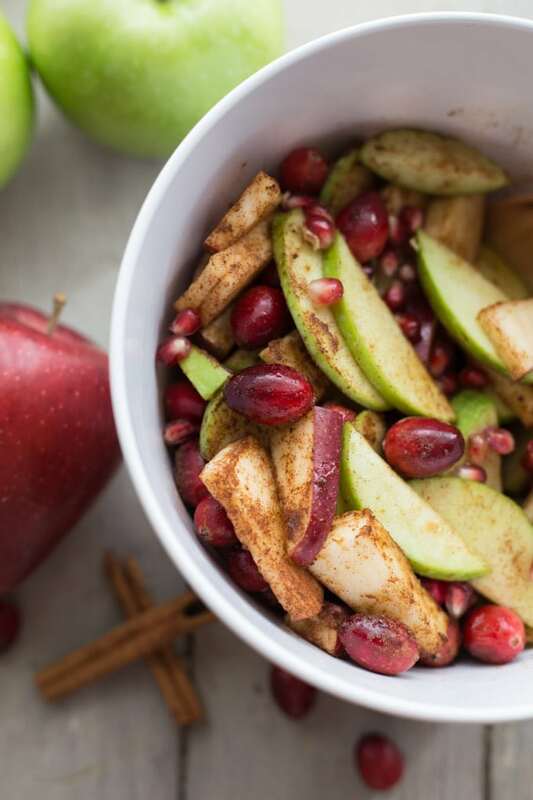 Prepare the fruit: In a large bowl, add the sliced apples, cranberries, 1/4 cup of pomegranate arils, maple syrup, coconut sugar and cinnamon. Stir until combined and add to the bottom of the cast iron pan. Prepare the crisp topping: In a large bowl, stir together the oats, pecans, coconut, coconut sugar, cinnamon and salt. In a small bowl, stir together the almond butter and maple syrup. Add to the dry oat mixture and stir until well combined. Add to the top of the fruit mixture and press down with a spoon. Bake for 30 minutes, or until the top is crispy and slightly browned. Do not over bake as the fruit bottom will get mushy. Remove from the oven and let sit for a few minutes. 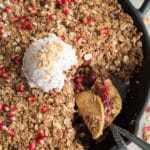 Before serving, sprinkle the remaining 1/4 cup of pomegranate arils on top and add some coconut cream. Store any leftovers in an airtight container in the fridge and enjoy within 3-4 days. 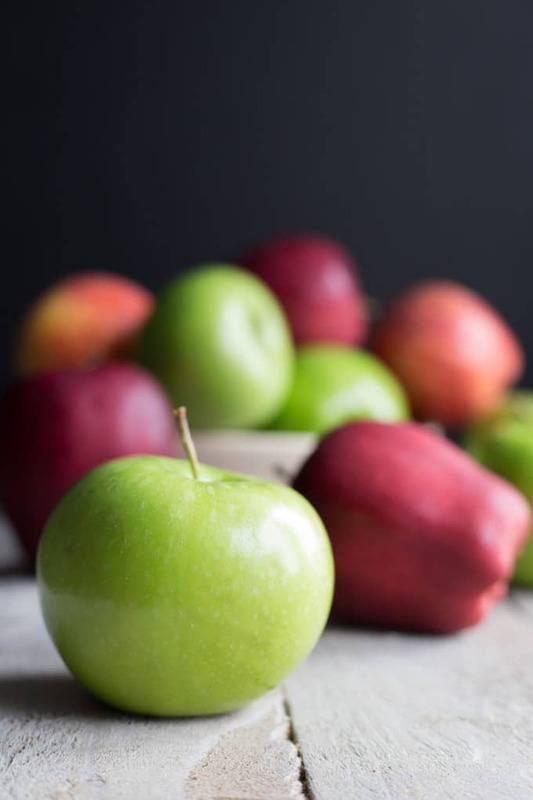 I used two Granny Smith apples and one Red Delicious apple for this recipe. I like the mixture of apples for color and taste. You can peel the apples if you like, but to save time, I leave the skin on. You also get more fibre by leaving the skin on.